At a NASA “industry and partner” briefing today on the Administration’s proposed Asteroid Retrieval/Redirect Mission (ARM – I’ll explain the forward-slash below), I felt as though I was witnessing an old-fashioned revival meeting (known only to me via the movies). While NASA’s event certainly had no Christian slant, it did, indeed, appear staged to urge members of the aerospace community to jump on the ARM bandwagon and inspire others (self-described by two “others” in the audience as “mad scientists”) to come along for the ride. Originally proposed in the Administration’s fiscal year 2014 budget request, with a $105 million budget, the ARM began as a three-part Asteroid Retrieval Mission. Part 1 would involve stepping up NASA’s existing effort to find, track, and characterize near-Earth objects (NEOs), Part 2 would involved developing and demonstrating high-power solar electric propulsion technology, and Part 3 would involve capturing an asteroid and towing it to “translunar” orbit so that astronauts could fly to the object and explore it “hands on.” All three elements would in theory contribute to planning for planetary defense – that is, protecting Earth from NEO impacts. The retrieval mission has evolved into a “redirect” mission. Bill Gerstenmaier, NASA’s associate administrator for human exploration and operations, explained today that “redirect” more accurately describes what the ARM concept involves – targeting an asteroid that’s already traveling toward rather than away from Earth – for clarity’s sake, I should say that he was NOT talking about an asteroid on a possible collision course with Earth – to somehow “redirect” it into translunar orbit, where it would be more accessible for human exploration. Gerstenmaier also mentioned a NASA concept study that is looking at the idea of targeting a large (100-meter-diameter) asteroid, capturing “part of it” and returning that chunk to translunar orbit for human exploration. According to Kessler, “We’re trying to create…a social movement.” In addressing who might be involved in this movement, Kessler showed a list of current and potential “contributors to the cause” (his words). 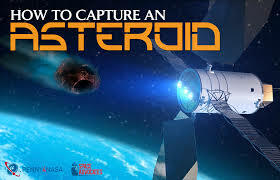 In kicking off today’s event, NASA’s deputy administrator Lori Garver said NASA is pursuing the asteroid initiative in the broader context of NASA’s mission of “advancing aeronautics and space activities for the benefit of humankind…. We’re very excited by the bipartisan support” in Congress for the ARM, and “we could not be more excited about the bipartisan support” for the planetary defense element of the initiative. “The public is pretty excited” as well, she said. Tom Kalil, the White House Office of Science and Technology Policy’s deputy director for technology and innovation, told attendees that the Administration is “thinking about asteroids not only as a threat but also as a resource,” which is important to the goal of extending human presence into space. Ay, there’s the rub, for me…. From the perspective that Kalil displays, exploiting extraterrestrial resources makes sense because humankind will colonize outer space. From my perspective, this rationale is not fact-based. It is an assumption, perhaps a belief. And the assumption that humankind will colonize outer space rests on the assumptions that the extension of human presence into space is both inevitable and good. This ideology of space exploration and development is just that – it’s a belief system. While this belief system is prevalent in the aerospace community, I’m not convinced – after more than 30 years of observation and analysis – that humankind widely embraces it. I know, you’ve heard me say these things before. I’m going to keep saying them until someone can persuade me that human colonization of outer space can, and will, be truly for the benefit of all humankind, including those likely billions who like it just fine right here. * Full disclosure: I do science communication research for NASA’s NEO Program.